For Radhika Swarup truth is central to how she writes. 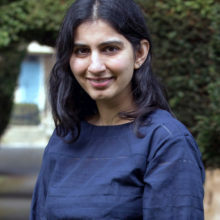 In this Q&A Radhika, a former investment banker and now author of Where the River Parts which tells the story of the tragedy that underpinned the Partition of India and Pakistan in 1947, muses upon her journey to becoming an author and emphasises the importance of history and family to her writing. Tell us about your debut novel, Where the River Parts? Where the River Parts follows a Hindu Muslim couple caught up in the traumatic Partition of India and Pakistan. They are separated during the process, and don’t see each other for the next fifty years. It is only half a decade later, as both India and Pakistan are testing their nuclear weapons, that the two meet again in New York and face an impossible choice. Where the River Parts straddles half a century and three continents, and has been described as a timeless tale of love, loss and the barriers we build between us. Tell us more about your journey into writing. When did you know you wanted to become a writer? I always wrote as a child, but stopped when I went to university. My degree was in Economics, and after I graduated I began to work in investment banking, and for a while it seemed as if my days of writing – of indeed reading for pleasure – were at an end. And then at a private equity conference in Frankfurt, I found myself surrounded by industry veterans crowing over the latest Financial Times article to call them vultures. I realised I hated finance. It was my 26th birthday, and a moment I remember with absolute clarity. I left the celebrations of the conference and went to my hotel room to write, and was the happiest I had been in years. What research, if any, did you do? What were your thoughts on the findings of your research? As an Indian, and as someone who has lived in Pakistan, I was familiar with Partition. My family was impacted by the Partition too, and we made the move from Pakistan into India, so the whole tumultuous period is engraved on our psyche. The sheer scale of the displacement, though, was unknown to me. 1 million people were murdered, and 16 million left homeless, largely in the 3 month period that followed Independence. I had to research these aspects of the past – the extent of the tragedy, the interactions between members of the Hindu, Muslim and Sikh communities in united India, the clothes worn during the period, how the flames of hatred were fanned – partly through books and other media, and partly through family accounts. I was both shocked and strangely un-surprised by what my research uncovered. Partition brought out both the best and worst in humanity, and we have seen the same emotional tapestry being woven far too often in recent times. Do you have a personal family history tied to Partition or did most of the inspiration and background come from your research? My family on my father’s side were affected by the Partition. They had to leave Lyallpur in West Punjab to make a new life in Delhi. Their experiences have largely seeped into the atmosphere I’ve tried to portray in Suhanpur, the fictional town my protagonists live in. I’ve had a wealth of details given to me about my family’s life in what became Pakistan, and I’ve tried to imbibe Where the River Parts with a sense of it. Beyond telling me about their life in Pakistan, though, my family didn’t share any of the horrors they witnessed with me. Other ‘children’ in my extended family were similarly protected. It is only now as we have grown, and now that I have tried to delve deeper in my family’s involvement in the Partition, that stories have begun to come out. About the relative who risked life and limb to return to Pakistan to retrieve a family heirloom. About the young boy who travelled on a train to India – and miraculously survived – despite the Hindu symbol Om tattooed on his wrist. About my paternal grandparents, who were married shortly before the Partition, and travelled to Karachi, a city that fell the way of Pakistan, shortly before the worst of the violence was unleashed. About intimidation, about neighbours on both sides of the border turning against each other, about tragedies, about cowardice, about opportunism and about remarkable heroism. I tried to focus on the fact that protagonists from that era and from that geography still had familiar concerns. A 17 year old girl was still consumed with her youth, her friendships and with love. She had no concept of a career back then, but she did recognise the need for education, and in that sense, she doesn’t feel so dissimilar to a young girl today. A 20 year old boy was still focussed on injustice, his career and the girl he loves. And though the setting is different for many readers today, I hope the common traits they share with the protagonists help make them feel real. How do you see your role as a writer and what do you like most about it? A writer tells the truth. That truth can take many forms – fantasy, irony, comedy or tragedy – and the truth itself can be contested, but to me the purpose of writing is to convey the world as it is or as it could be. Have you ever created a character who you dislike but find yourself empathising with? To a large extent I feel proprietorial towards my characters, and even when they behave in a way I wouldn’t personally condone, I find myself understanding how they have arrived at their choices. If you could be transported instantly, anywhere in the world, where would you most like to spend your time writing? And why? Rome. I spent a large portion of my childhood in the city, and there is something about the sun, the light, the unhurried way of life, and about the Roman relationship with art and beauty that never fails to inspire me. What advice do you have for would be novelists? We’ve all heard this before. Read and write, but it really is true. The more you read, the more you learn to perfect your own writing. And it is invaluable to get yourself a support group. Join a course, a writer’s group, write with friends. An online group, even. Anything that allows you to read other people’s writing and to get feedback on your own. And what’s next for you? Are you working on something new? I’m working on my next novel, which examines a woman’s response when the world she knows changes forever. It’s an internal exile, if you will, as compared to Where the River Parts’ epic journey. It’s in the early stages at the moment, but I’m really enjoying delving into her life. 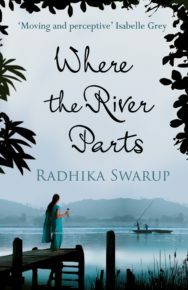 Where the River Parts by Radhika Swarup is out now published by Sandstone Press priced £8.99. 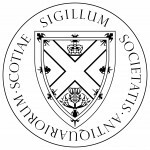 You can read an extract from the novel on Books from Scotland here.